Acting for Wilton Developments, Leeds-based Castlehouse Construction has completed and handed over a newly built £1.7m Aldi supermarket on Water Lane near Clifton on the outskirts of York. The new store will be the third Aldi to open its doors in York, complementing existing outlets at Monks Cross and Fulford. 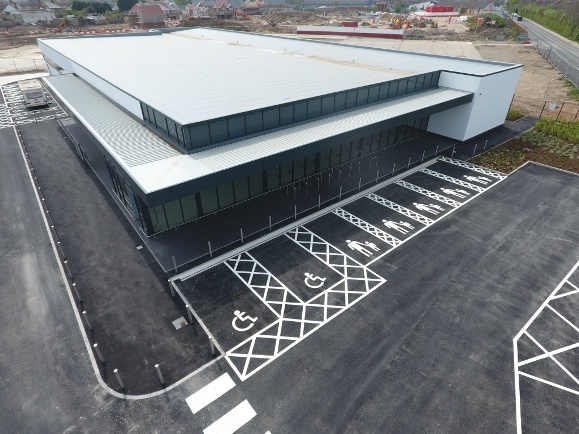 This latest Aldi store, on behalf of landlord Water Lane Ltd, is one of 70 outlets the company plans to open this year and is the 701st store built since the retailer opened its first UK store in 1990. The store forms part of the discount supermarket chain’s ongoing plans to launch 1000 outlets by 2022. The store comprises 18,750 sq ft and is situated on the former Grain Stores site, a 19-acre brownfield site on the edge of York. The property offers a spacious and attractive shopping environment for customers. The new supermarket has created circa 30 new jobs and also delivered junction improvements and new access onto Water Lane. Jason Stowe, managing director, Wilton Developments Ltd, said: “We are pleased to see the completion of the Aldi which forms the first part of 3 separate plots on the remaining land Water Lane held after the sale to Redrow.